This portrait is paired with Portrait of a Woman despite their different sizes, as the female image was cut down at the edges in the past. In both works the sitters’ positions conform to the model developed in the Low Countries in which the man occupied the left side and the woman the right. Their busts fill the entire pictorial space, an effect increased by their clothing, which is almost indistinguishable from the backgrounds. In contrast, the artist emphasised the faces, the fur trim of the clothes and the hands that hold rosaries and flowers. In the case of the wife, the flower has been identified as a pink, which was associated with fidelity in Flemish culture. Similarities have been detected between the female portrait and two others, one in the National Gallery, London, attributed to a Swabian master of the 1460s, and the other in the Kisters Collection, attributed to Ludwig and Martin Schongauer. This portrait paired with the Portrait of a Woman entered the Thyssen-Bornemisza collection at different dates and from different sources. The female portrait entered the Collection 1928 and was included in the 1930 Munich exhibition. It was acquired from the Hackenbroch gallery in Frankfurt and was previously recorded as having been on the Amsterdam art market and in a private Berlin collection. The male portrait was acquired at the Fleischmann gallery in Munich and entered the Collection in 1933. Prior to arriving at the Fleischmann gallery it was auctioned on two occasions: in Cologne in 1930 and in Munich in 1933. Its earliest known provenance is the collection of Marczell von Nemes in Munich. The different size of the two panels is due to the fact that the panel of the female portrait was cut down a few centimetres. 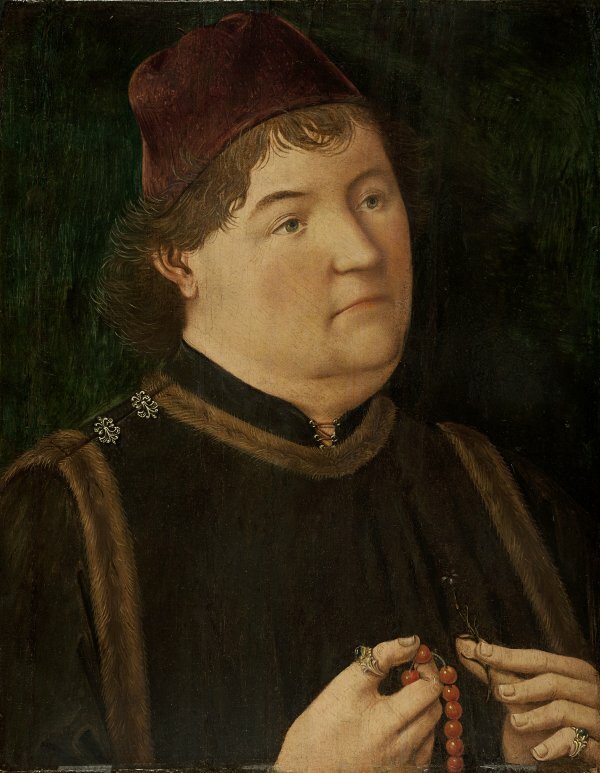 The female portrait has been attributed to anonymous masters in Styria or Swabia. From 1937, when both works were first published as part of the Thyssen-Bornemisza collection, it was attributed to an artist working in Swabia. Nonetheless, in 1969 Christian Salm attributed the pair to an anonymous master in Ulm and dated them to around 1470–80. Isolde Lübbeke also considered them to have been produced in Swabia or the Upper Rhine. The two images, which depict a married couple, are stylistically related although the portrait of the man uses a harder, more linear technique in the features, an effect that may, however, be due to restoration resulting in the loss of some of the glazes. The manner in which the artist depicted the couple and the setting recall models developed in the Low Countries and which were undoubtedly familiar to this anonymous painter. Bust-length against dark backgrounds, the man occupies the traditional position on the left and the woman on the right. Their bodies almost fill the widths of the panels, an effect heightened by their clothes that are barely distinguishable from the backgrounds. The artist has truncated the hands at the lower edges of the panels and their arrangement and positions suggest that they were intended to interact with the original frames in order to emphasise the sense of pictorial depth. In their hands, adorned with rings, this pious couple hold rosaries with beads of different sizes. They also hold finely painted flowers: the woman points with her index finger to a small bunch while her husband delicately grasps a pink. This flower, which was often depicted in similar compositions in Flemish art, had connotations of fidelity. The couple are also visually linked by the similar colours of their clothes and the fur edging of their garments. The female portrait has been compared to two others. The first, which is similar with regard to the style and clothing, is by a Swabian master and is dated to the 1460s (National Gallery, London). The second, in the Kisters collection, has been attributed to Ludwig or Martin Schongauer.